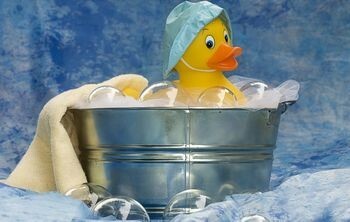 As a child, I remember thoroughly enjoying bath time. It could have been due to the fact that I was able to go swimming in my own effing house, or the fact that I was able to splash everywhere, thinking I was making a mess, but in reality, I was just helping with the cleanup. I remember this one time, when Duffy and I took a bath together, he pooped in the bathtub and then started to cry. I don’t think I was supposed to tell anyone that story. Happens to the best of us, sorry Duff! Over the years, I’ve grown to not liking bath time so much. As hot as I make the water, I still end up freezing my little tush off. I could blame the size of the bathtub, however, I have decided to blame myself, for the first time ever. I can’t remember the last time my entire body was able to be submerged into a bath all at once. When I try though, I need to stick my legs in the air, and then try to dunk my whole body. That doesn’t really work out, because the second I need to get up, my bath becomes a giant wave pool and before I know it, my entire bathroom has been flooded- lets just say the Asian family below me isn’t so happy. This past weekend, I tried to do a little experiment, and try to figure out how to take a real bath like a real human being, and really enjoy myself. After a lot of thinking, pruney hands, and ice cold water, I had finally figured it out. The only way I was able to do this was to lay flat on my stomach with my arms by my side and dunk my head under water. This was a sight to be seen… or not. Getting up was a challenge, and took a good five minutes. Instead of having goals for myself, like I want to wear this pair of jeans, or to lose five pounds, my goal for this year is to immerse my entire body in a bathtub and enjoy my bath like I used to as a child. Except, maybe I won’t invite my brother to take a poop.